This post is Part 4 (the grand finale) of a 4-part saga. To read Part 1, please enjoy: AppleCare Needs a Frequent Flyer Program. It’s time for the final post about my MacBook Pro and iCloud woes from this week, because after four full days, both are finally working! The path there was fascinating. To recap, my 2016 MacBook Pro went into Apple repair because it wouldn’t charge, and my 2013 MacBook Pro, which was restored from a backup of the 2016, couldn’t access any Apple cloud services. My little friend Erica from Executive Relations had escalated my repair, while my little friend Senior Advisor Specialist Joe was helping me crack the code on iCloud with engineering. The good news is that my 2016 MacBook Pro was returned to my hot little hands on Wednesday afternoon, day 3 since it had been shipped, day 5 since it had died.But Wednesday morning, before I picked up the 2016, Joe and I got back together on the phone to work on the 2013 MacBook Pro problem some more. Joe told me something really interesting. Remember how I’ve been saying that Apple stole my stuff from me, because they had a block on my system? I learned about the block a few days earlier from Senior Advisor Guin, who said she could see the challenge on her end and that she’d been seeing this a lot lately. Well, in talking to Joe, he said that he could not see my machine being blocked, and neither could engineering. Very interesting. Engineering looked at the results of the scan they had me do of my system while I tried to authenticate, and they found the root cause. In our top-level Users folder, we have our own user, and any other accounts we have created. We also have a Guest account. If you’ve added a second account to your Mac, there’s also a Shared user. This allows you to share files between users. In order to do this sharing, the privileges for this account must be that everyone can read and write to this user folder. 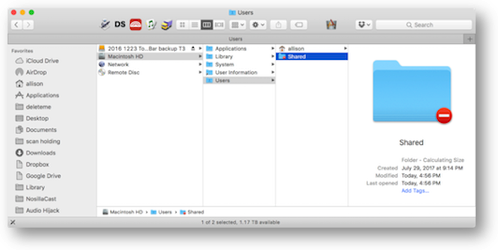 Engineering discovered that the Shared user folder on my 2013 was locked. Doing a Get Info on it showed that the System and Wheel had privileges but Everyone wasn’t even listed, and I couldn’t add Everyone to the list. Engineering gave us a link to an Apple Support Article with instructions on how to unlock the Shared folder. The support article is HT204649 and it’s entitled “If you see a -45054 error in the iTunes Store”. Now why didn’t I search on that term to begin with??? As soon as I did that permissions change, the red minus sign disappeared, the Get Info window showed Everyone had read/write/execute privileges, and more importantly, I was able to connect to iCloud services. To say that I did a happy dance is not an exaggeration. It brought a song to my heart! I danced off to the Apple Store, picked up my 2016 MacBook Pro, and as expected the drive was brand spanking new. That’s because they’d replaced the logic board and the SSD is soldered to the logic board on the new Touch Bar MacBook Pros. I didn’t have a worry, because remember I have three backups! I plugged the SSD backup drive into the 2016, the same one I’d used to set up the 2013. I booted to that drive, and then looked at the Shared User. It was locked. So using my trusty Terminal, I unlocked the Shared user on the backup drive. Now I was confident that running the backup backwards to shove the backup data onto the 2016 would work flawlessly. Luckily both internal and backup drives are SSDs, so it only took about an hour to move 800GB of data. The first thing I did after the backup was completed was to boot to the internal drive and check that pesky Shared folder. It was unlocked! Yay! The second thing I did was to try to connect to iCloud … and I was denied. I couldn’t believe it! NOW what am I supposed to do? Earlier Joe had suggested that an interesting test would have been to partition the drive of the 2013 and add a second OS to it, not restoring from a backup, to see whether I could log in there. I figured I had nothing to lose, so I partitioned my 2TB internal SSD on the 2016 to add a 128GB partition. Normally that would be a very scary proposition, right? But I’ve got three backups and I’ve got a problem I have to fix, so what the heck. After creating the partition, I booted into Recovery Mode (⌘-R). That allowed me to install macOS on my 128GB Partition. With breathless anticipation, I rebooted to that new partition and it asked me if I wanted to log into my account. Now remember this is before any users have been created, so there shouldn’t be a shared user yet, right? And my SuperDuper! backup drive has had nothing to do with this partition, right? But again, I was denied. Let’s go through this logically. We’ve eliminated the 2013 MacBook Pro hardware because the problem is also on the 2016. We’ve eliminated the Shared User because it shouldn’t even have been created yet on the 128GB partition. So … yeah. We’ve eliminated everything. At this point I called Dave Hamilton on the phone. He and I noodled the problem for quite a while. We didn’t come up with any eureka moments where we realized what it was, but he advised that it was time to punt on that backup. He said that he used to advise his customers when he did home support that there’s a point where the path that looks long is often the faster path. I wasn’t ready to throw in the towel yet, possibly because I had a perfectly functioning 2013 to fall back on. He said one thing that was curious. He wondered whether simply having that backup connected to the 2016 allowed whatever was going on to leak over into the 128GB partition. He thought of that because he’d seen things like OS X creeping across the network to grab the wrong thing from a Time Machine backup on his NAS. It was clearly time for a walk with Tesla to clear my head. We saw a gorgeous sunset. I came home and had a glass of Lineback Cabernet Sauvignon. And I thought of one last idea. I unplugged the backup drive as Dave had suggested, booted into Recovery Mode, and erased the entire drive yet again, and reinstalled macOS from Recovery. When it was done, it asked me to log into Apple services … and it worked. Ok, that’s definitely progress, but we shouldn’t get too excited because we’ve been burned before. Remember we don’t have any of my stuff back on the 2016 yet. Here’s my dog walk/red wine-induced epiphany. I decided not to use SuperDuper! to put my data back, but instead to use Migration Assistant. I plugged my backup drive in, ran Migration Assistant, and let it do its thing. And when I booted it up and went into my user account, it let me into my iCloud services. Seriously. Finally, Steve pointed out that I must retract my statement that Apple stole from me. That feeling was based on Guin telling me that the serial number of my machine had been blocked on their back-end servers, and that only engineering could put it back online. Joe never saw that, and obviously based on the solutions, that can’t have been the case. So I take it back, Apple didn’t steal my stuff. But the best part of this, as I explained to Joe, is that as an engineer, it’s going to bother me for the rest of my days that I do not know the actual root cause of this whole mess. Thanks, Barry. On your advice I ran MalwareBytes and it found nothing amiss. Thanks for the low-impact idea. Congratulations, Allison. 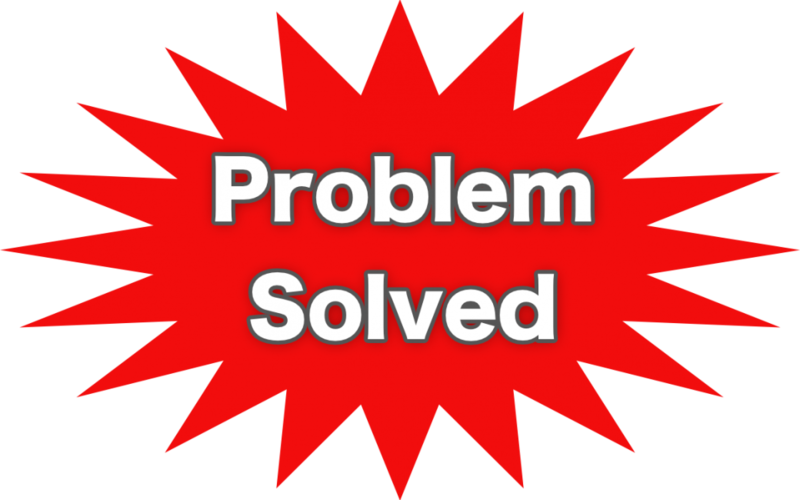 From time to time, I’ve solved a problem by fiddling around but never knew why the problem went away. (I think this relates to my younger years when one could kind of kick a TV to see if the picture would right itself.) Not knowing is frustrating, but congratulations on getting back to normal. All’s well that ends well. Yay! So glad your Mac saga has finally returned to all good. I’m wondering if checking in with Dave Nanian again could provide any more insight on what went down. Looking forward to hearing about it on the podcast. Have a great week Allison! Allison, I’m glad you are not my client! Suggestion: do a piece on your methodology for how you document and keep track of your contacts with AppleCare and everyone else.